Many people have no idea what that funny little icon is on some webpages. It’s not really hurting anything so most people ignore it as another “computer thing” that they don’t need to know about. Others, who know what RSS is, know it as a easier way to stay on top of blogs. However, even these people aren’t taking advantage of a lot of the things that RSS can do for them. RSS can change your entire browsing experience for the better if you let it. RSS, or Really Simple Syndication, tells you when a webpage has new content. That’s it. It works a lot like a magazine subscription. Just like you subscribe to your favorite magazine instead of going to the corner store every few days to see if there’s a new issue, you subscribe to your favorite webpage’s RSS instead of going to the page every few days to see if there’s new content. And just like how you tell the magazine company to send the issues to your mailbox, you tell your RSS subscription where to go, usually to an “RSS Reader” that acts as the mailbox for your RSS feeds. Pull an RSS feed from your favorite organization’s “Employment” page so that you’re notified any time they post a new job. Subscribe to an RSS feed for your favorite store’s “Sale” webpage to find out when new deals are available. Get notified of new Twitter tweets with your name by pulling an RSS feed from your search. There are many ways to organize your RSS feeds so that staying up to date on your favorite sites is convenient and not just another hassle. Tools like Google Reader and Bloglines arrange RSS feeds in a way that makes their content easy to read. Feeds are usually listed on the left and the right side of the screen is reserved for viewing the content of the selected feed. Readers are good for when you actually want to read the content of your feeds such as blog posts rather than search results. This one is specific to Firefox, but I thought it was worth mentioning on its own because I personally get a lot of use out of it. 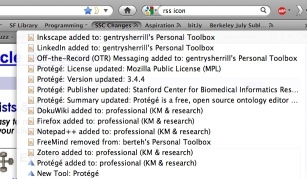 When you click on an RSS icon in Firefox, it will ask you what to do with it and one of the options is to create a “Live Bookmark” which allows you to put an RSS feed into your toolbar as a dropdown list showing the changes. This is not too useful for reading content, but it’s great for searches or other RSS uses. Personally, I keep a live bookmark of the “All Changes” RSS feed for SSC so I can easily just click on it in my browser to see what’s going on the site. What is your favorite RSS Tip or Trick? Let me know!